Oh these cookies are so much easy to make and they taste great. If you like marshmallows and cotton candy then you will definitely love these. You can eat them as is or you can serve them in a platter with fruits, whipped cream, ice cream etc. They are so crisp and nice on the outside yet soft and chewy on the inside and they just melt in your mouth. Its wonderful how just 2 simple ingredients can make such a tasty cookie. 2. Place parchment paper on a baking sheet. 3. Crack the egg and separate the egg white when it is cold and leave the egg white in a bowl covered lightly with a kitchen towel for half an hour to bring it to room temperature. 4. If you do not have caster or superfine sugar, you can blend normal granulated sugar in a food processor. It is not Icing sugar. 5. In a mixing bowl (preferably stainless steel) place the egg white and whisk it lightly till foamy. 6. Add the salt and continue to whisk on medium speed till soft peaks form. 7. Add the sugar little by little and continue to whisk till meringue holds stiff peaks. 8. Add the vanilla extract and beat till combined. Add food color to reach desired shade and mix well. 9. 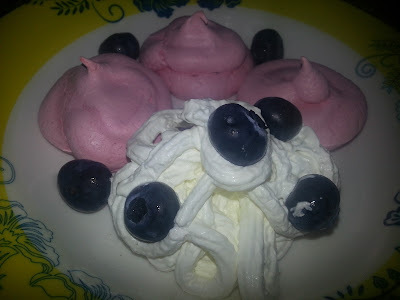 Rub a little of the meringue between your thumb and index finger and if it is grainy then you need to whisk more. 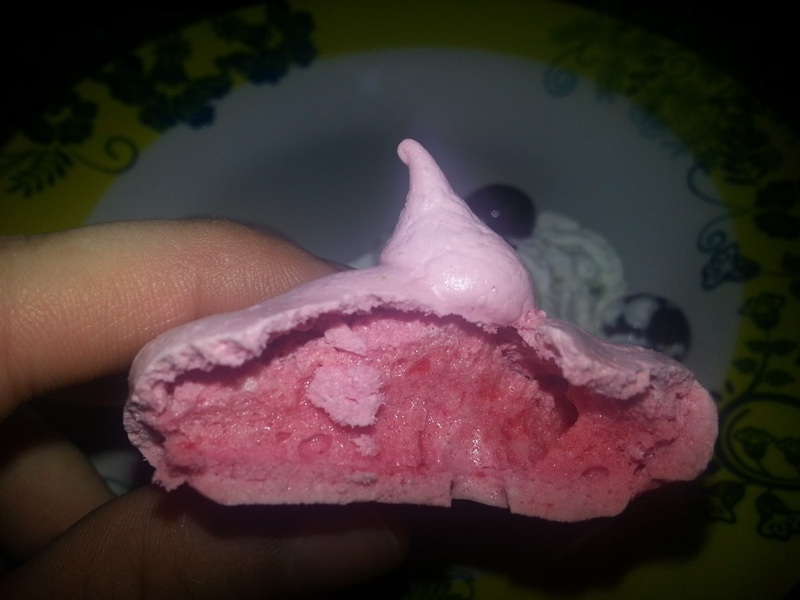 The meringue must be smooth when you rub between fingers. 10. Place a little of meringue under the corners of the parchment paper to prevent sliding. 11. Transfer the meringue to a pastry bag with a 1/2 inch tip or just cut off a small hole. Pipe 5cm sized rounds on the parchment paper. You can also use 2 spoons and spoon mounds of meringue on the baking sheet. 11. Bake the meringues for 1 1/2 to 1 3/4 hours. Rotate the baking sheet midway to ensure even baking. 12. Bake till they are quite crisp and peel easily from the parchment paper. 13. Turn the oven off and leave the door a bit open. Let the meringues remain in the oven to finish drying for several hours. 14. 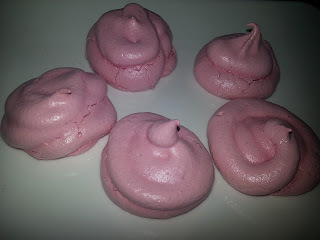 Meringue cookies can be covered and stored at room temperature for several days.